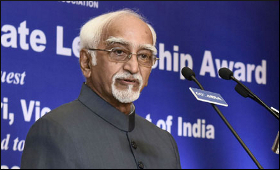 The Vice President of India, M. Hamid Ansari has said that a large and populous nation like India needs manufacturing to be a significant part of its Gross Domestic Product (GDP) to ensure higher employment and prosperity. The Indian manufacturing needs to improve dramatically in terms of productivity and efficiency to compete in a globalized market. The Vice President said, "For profitable growth, we have to strive for a premium that will accrue only if we target products that need high quality design, engineering and manufacturing." He said that test before our companies is to develop business capabilities that equip them to compete at the top of the value chain. "There is a genuine need for change in the internal environment of Indian firms that can foster competitive thinking and behaviour. We are globally recognized for our services sector that contributes more than 60 percent to India's GDP. A large and populous nation like India needs manufacturing to be a significant part of its Gross Domestic Product (GDP) to ensure higher employment and prosperity." He was addressing the gathering after giving away the AIMA - JRD Tata Corporate Leadership Award in New Delhi on Tuesday. The Vice President said that the future growth of our companies will be in being able to create futuristic business scenarios and engineering disruptions rather than coping with its aftermath. Earlier, the Vice President mentioned the inherent weaknesses of our corporate sector including risk aversion, debt-addiction and low R&D spending. Indian manufacturing, however, needs to improve dramatically in terms of productivity and efficiency to compete in a globalized market. According to the Asian Productivity Organization's (APO) Productivity Database 2014, the average Total Factor Productivity (TFP) growth in India increased from 2 percent in 2000-05 to 4.7 percent in 2005-10, but fell by 0.9 percent in the next two years. In 2010-12, TFP contributed 11 percent to GDP growth in India. By comparison, its share in China's GDP growth was 26 percent. Currently, most Indian companies operate at the bottom of the global value chain by selling components or unbranded products, he added. The Vice President said that said that our corporate sector has to invest, and heavily, in R&D and innovation. He further said that merely offering incentives to industries may not be enough to spur innovative growth. "We need to eventually work towards inculcating the 'culture and attitudes' needed to foster innovation and entrepreneurship," he added.